Holy Week is a time of reflection for Catholics. We are nearing the end of Lent and preparing to celebrate the Sacred Triduum. It is a time for us to come together, united as a global church in remembering that our Lord died to save us. During this holiest of weeks for us as a Church, we have witnessed the near destruction of one of the most important symbols of the global Catholic Church. The fire at Notre Dame Cathedral in Paris has mobilised Catholics, other Christians and non-Christians all over the world, with people as far away as Australia donating to the reconstruction effort. The response on social media to the horror of the fire during Holy Week has shown the world that the Church can still come together in sorrow and in prayer. But what often goes unnoticed is how good we are as a Church at coming together during Lent and at Easter to support our international Caritas network. As we here in the Plymouth Diocese have been reaching out to our fellow parishioners to be generous in supporting CAFOD’s work through our Family Fast Day appeal, our Caritas colleagues in Australia have been asking their fellow parishioners to be generous in donating to Project Compassion, their annual Lenten Appeal. As we have been holding second collections to raise money for the Cyclone Idai Appeal, so too have our Caritas colleagues in New Zealand. By working alongside and in partnership with communities in England and Wales and internationally within the Catholic Church and beyond, we have global reach and local presence. Together, we form one of the largest development and humanitarian networks in the world, with the potential to reach everyone. We believe that if one of us is hurt, hungry or abandoned, we all are hurt, hungry and abandoned. No one should be beyond the love and support they need to live a dignified life. So as long as we are needed, we will keep working to reach those most in need. With our global reach and local presence – and with you standing alongside us every step of the way – we know we have the potential to reach everyone. As Pope Francis said: With trust in the power of the Gospel, we can make a real contribution to changing things, or at least to making them better. Family Fast Day is on Friday, 15 March 2019. Pledge to have soup this Family Fast Day and get your family, friends and parish involved. Show your witness to the love and compassion that CAFOD stands for. Let’s pledge together in the Plymouth Diocese to make a difference for the poorest, most hard-to-reach people around the world. Let’s all eat simply so others can simply eat! Many parishes in the Plymouth Diocese have organised soup lunches to mark Lent Family Fast Day on 15 March or on other days in Lent. If you can, come along to one near you and support CAFOD. We are so grateful to our own “artisans of peace” – all our volunteers, supporters and parishioners who extended a helping hand in 2018 to enable CAFOD’s life changing work. None of our work would be possible without your kindness, generosity and enthusiasm. We begin 2019 with a new sense of hope about our work. Although the scale of the task ahead is large, the exceptional dedication of CAFOD’s volunteers and supporters in the Plymouth Diocese – evidenced by a very busy end of 2018 for CAFOD in Plymouth – continues to inspire us. On 30 November, we remembered and honoured supporters and parishioners who have passed away over the last 12 months in a lovely Memorial Mass at St Mary’s in Poole, Dorset. Sincere thanks to our Dorset Deanery Area Coordinator Alannah Bolt for her efforts in coordinating this Mass and inviting parishioners to participate. It was great to see volunteers from other parts of Dorset at St Mary’s too. Fr John Webb, Parish Priest at St Mary’s celebrated Mass and was very generous in his recognition of CAFOD’s supporters and in his ongoing strong backing for CAFOD’s work. 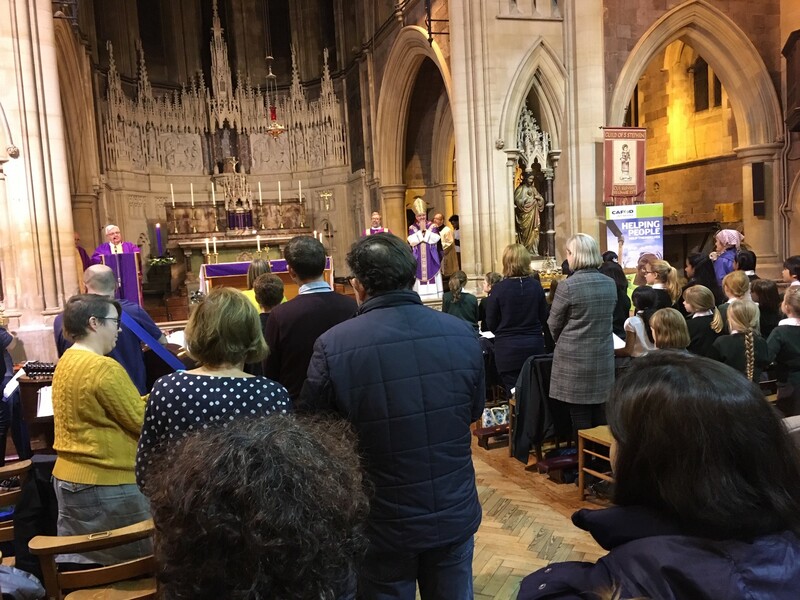 In Plymouth’s Cathedral Church of St Mary and St Boniface on 5 December, groups of pupils from five Roman Catholic primary schools in Plymouth participated in the last Share the Journey activity for the Plymouth Deanery. The service, which was assisted by Deacon James Barber, was designed to enable those who have not been physically able to join other Share the Journey activities to participate and gain an appreciation of the experience of refugees and migrants. The service was based around the Stations of the Cross and the pupils acted out the stations as the congregation followed them, likening the journey of refugees to parts of the journey Christ experienced as He carried His Cross. The pupils all did a remarkable job, demonstrating their own understanding of the challenges faced by the world’s refugees. Our hymns and prayers of the faithful, prepared and read by Monica Evans, also reflected the theme of extending help and friendship to those in need. To symbolise our support for the Holy Father’s call to us to “see, and then enable others to see, that migrants and refugees are brothers and sisters to be welcomed, respected and loved”, the pupils of St Joseph’s Catholic Primary School processed into the Cathedral carrying the Lampedusa Cross. Huge thanks to Plymouth Deanery Area Coordinator Gill Mill for her extraordinary efforts in designing the liturgy, bringing the schools (Cathedral School of St Mary’s, St Paul’s Catholic Primary School, Keyham Barton Catholic Primary School, St Joseph’s Catholic Primary School, St Peter’s Catholic Primary School) together, preparing the pupils, encouraging the less mobile of parishioners all over Plymouth to join us in the Cathedral and overseeing the service. It was a most meaningful and moving service that will stay in the hearts of those who experienced it. In a further demonstration of the power of community in the Plymouth Diocese, the Union of Catholic Mothers hosted a morning tea for everyone who attended the service and raised in excess of £75 for CAFOD. Finally, in Exeter’s beautiful Sacred Heart Church on 8 December, we were privileged to have our Bishop, the Right Reverend Mark O’Toole celebrate the annual CAFOD Advent Mass with Parish Priest Fr Kieran Kirby. 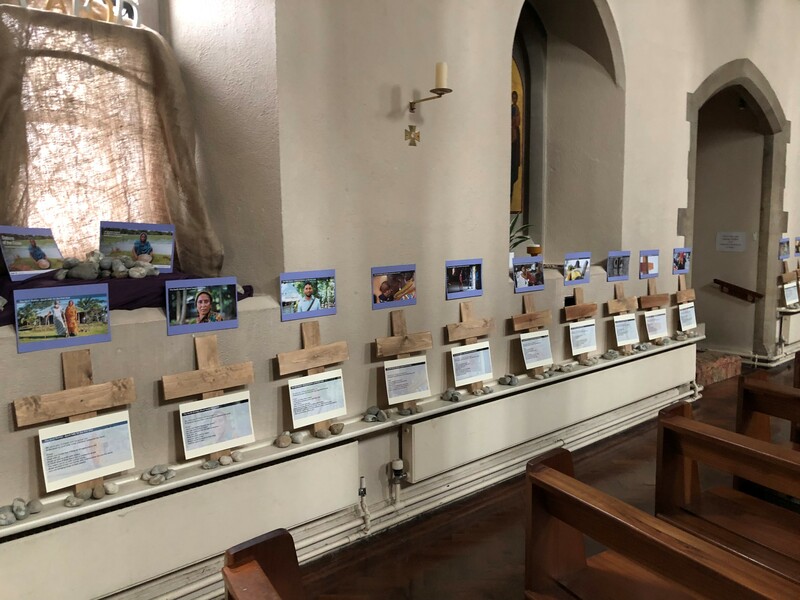 CAFOD volunteers and children brought three symbols to the altar in recognition of the journey of Mary and Joseph and the journey that refugees make in fleeing their countries – some pebbles, a small bowl of honey, and a clump of straw. The pebbles represented the journey for Mary and Joseph (and for refugees), the honey represented the wild honey John the Baptist ate in the desert (and the food that refugees must find) and the straw represented the crib Mary prepared for the baby Jesus (and the shelter refugees must find). Grateful thanks to the very talented musicians of Sacred Heart and the children of St Nicholas Catholic Primary Academy in Exeter for the superb music and singing. Thanks to our Exeter Deanery Area Coordinator Chris Wightman, to Fr Kieran, to Gerry Hinton, to Deacon Lester Yeo, and to Veronica for all their help with organising the liturgy and to the parish volunteers who helped with catering. The Mass was a wonderful celebration of our community and the dedication of our volunteers. As we all prepare to tackle the challenges that 2019 brings us, think about making a New Year’s Resolution with a difference. Help us to transform the lives of our brothers and sisters living in poverty overseas by choosing a different sort of challenge in 2019. Be an artisan of peace by joining our team of volunteers and help to change lives. Contact us via email: Plymouth@cafod.org.uk or telephone 01752 268 768.